We wrote recently about how coffee machines are making a welcome return to the world of vending. Coffee has become big business in recent years, with people seemingly happy to pay ridiculous amounts of money to get their hands of a nice cup of java. At the head of that movement was Starbucks, a Seattle based company that somehow transformed the morning cup of Joe into a luxury item that came with the customers name scribbled on the cup. Barista became part of the working mans lexicography, as did paying $5 for a single cup. The dismal economy of the last few years has caused Starbucks to look at the way they do business and institute some changes. 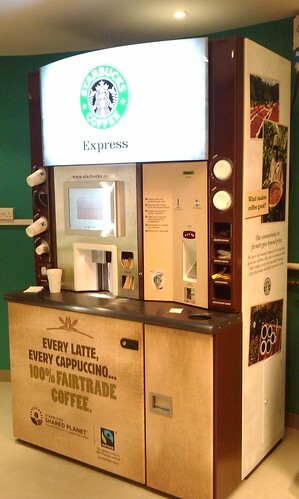 We are not yet ready to admit that we can see the future when it comes to vending machines, but the news that Starbucks are about to start placing their own machines in offices, airports and gas stations does make our earlier coffee vending machine post look a little prescient. The big selling points with the Starbucks vending machines include the fact that they will be using freshly ground beans in every cup, delivering the drink at a cheaper price than in stores, and also offering 280 different drink variations from a single machine. While that all sounds great in principle, there is still some question as to whether or not regular Starbucks customers will embrace such a move. The majority of folks that get their coffee fill from Starbucks retail stores claim that they do so because the quality of the coffee they receive there is better than anywhere else. The feeling may be that by going the vending machine route the , Starbucks will somehow be “slumming it” and delivering coffee that is far below their usual standards. The jury is out on whether or not customers will embrace the Starbucks vending machines, but what we are sure of is that it will create a fabulous opportunity for those looking to get into the vending machine business. The same people that frown upon the Starbucks way of making coffee will be looking for an alternative to the big name java makers. What that means is that coffee vending machines that offer a quality product at a great price will be able to go head to head with the Starbucks machines. Coffee vending machines are back and here to stay, just as we said they would be. The fact that a company that makes their money off of the coffee bean is jumping aboard the vending ship should be the ultimate proof in that pudding. If you have thought about dipping your toe into the vending machine business, then now might be the best time to do so. There are new and used machines available that will fit any entrepreneurial budget, so why not take a look to see what’s available right now and then jump right in with both feet. ← Got Milk? Vending Machines Do. We are interested in your vending machines here at Lackland for our students who would we need to contact.